Many of you already know Joe (aka JackDaniels) is collecting and compliling vintage Gretsch serial numbers. I thought it would be a good idea to carry that thread over. Do we have your numbers yet? The only way to make this work, is for you to offer your data, as others have already. My goal is to have an entry every 100 numbers (aproximately each batch of guitars). Many areas like 58 and 59, we have many numbers for each batch, but some guitar batches are still missing. I would like serial numbers from all Gretsch guitars from 49-64. Accoustics, Electrics, Baritones etc. All models from Burl Ives to Salvador, from Jets to Nashvilles. 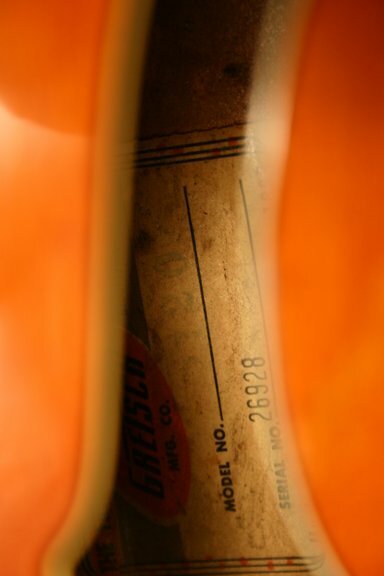 As long as it has the standard Gretsch label or an engraved number on the top of the headstock, we need the number! Send me a PM or Email with your data. Serial number, Pickups, Fret markers, bridge, tail piece, color, and anything unusual. Pictures welcome, and I may ask for more data late. I know it says send a PM, but this is an interesting guitar, so I thought I'd post it to the thread. I have what I believe to be a 1962 Country Gentleman. Serial number stamped on the headstock plate is 48375. It has a narrow 1-5/8" nut width, thumbnail inlays, and open F-holes which I've never seen before on a vintage Gent. At the F-hole edges, it's easy to see that the top is 3-ply, and it measures just slightly under 1/8" in total thickness. It has twin rail bracing, and no post or trestle, so it's fully acoustic, and surprisingly loud unplugged. It had one original Filtertron when I got it, and I've added the second one. Binding has a few darker-looking spots, but basically very good. All the mute hardware is long gone, but switches, pots, and knobs are original. It's strung up with Pyramid flats, and through my Vox amp the sound is absolutely to die for. Wider fingerboard prototype Butts SuperTron and 8k wound Filter Tron at the bridge. Later changed out Super Imperial stair steps for 'butter bean' keys. Eventually restored tone knob and removed mudswitch. It is a Tenny, before they gave it a name. Vintage 1961-62 -- Looks just like the new Tenn. Rose models, a little faded. Mud switch + standby switch. 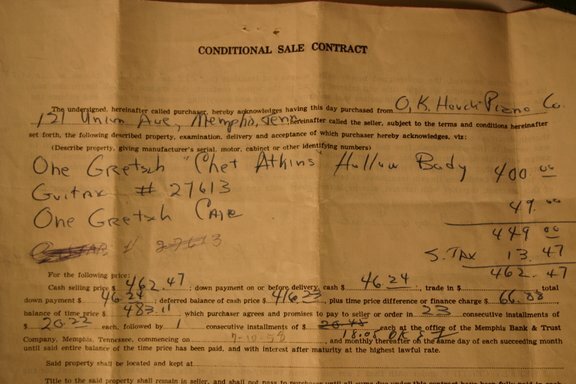 21641 is a 1957 6121, Sunset Orange, Chet Solidbody not a 6130, Natural Roundup. Hi Joe here's an early 60's single anny (no fretboard binding) but has 1957 serial number. That's cool Joe ... Nice avatar! '58 - Country Club (6192) #28514... trestle braced, spruce top, PAF filters, gold hardware, Sunburst finish, neo markers, G-tail, imperial tuners. '64 - Country Gent #68172... dbl. cut, mutes, headstock plaque, neo markers, V-bigsby, bar bridge, gold hardware, seems to have 1 filter and 1 supertron (?). SN 26928 1958 6120 Orange, Filtertrons with no writing on them, thumbnails, brass nut,no zero fret, no horseshoe-only "GRETSCH" on headstock, lots of wear on back of neck but little fret wear??? I'm still struggling with posting links.. sorry if this one dosn't work. SN 35565 2 tone Green Anniversary 6125? sorry, couldn't post the links for pix. Do you have any spec's on the Annie, like color. I'll assume it's a Hilo example. I'll also assume no trestles. This a huge huge undertaking, Joe. That DA came to me stripped, but with the two-tone Caddy color scheme visible under the pots. I restored it to the original colors, but the paint has not yet fully cured, Some pics of the early stages of the restoration can be seen under my post "Restoring a 1960 Double Anniversary". Right on the lack of trestle bracing and the HiLos. BTW, that's the guitar in my avatar. Hello Jack, You have seen this this 59 anniversary quite a few times. However, It is not in your list yet. I would love it to be in there. To finally be part of Gretsch history. Are you just wanting specific years, types or eras or do you want serial No.s from Baldwin-era solid-body guitars too? Hi Mike... Jack Daniels is looking for anything from '65 or earlier. Hi Joe... been on The Bay, here's what she's got this week! '62??? New Yorker...#48719, Uncut, unbound, Sunburst, trapeze, modded with Gibson fretboard, truss rod, floating pu, new tuners. '58 6186 Clipper...#27823, Sunburst, single cut, G-tail, 1 Dyna... broken neck and stripped for parts.